He has been the most important guitar player of all times in Portugal. 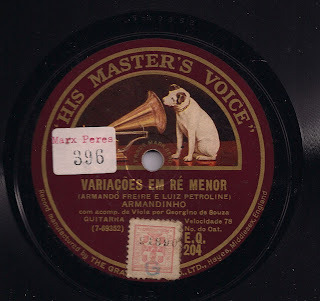 When you listen anyone of the performances recorded in the 78 rpm that survive till our days, it seems that he is not from this world! The sound he gets from the guitar is magic and unique. All the guitar players that use this instrument as a way of living are unanimous, saying that ARMANDINHO was unique! As Armandinho there are other performers of the portuguese guitar that we will bring here in the next months. We can give some names only for reference: EDUARDO ALVES, JOÃO MARIA DOS ANJOS, PEDRO D´ARAÚJO, JOÃO PEREIRA DE BARROS, ERNESTO BRANDÃO, ANTÓNIO BROJO, CARLOS CAMPOS, JOÃO DO CARMO and many others. Here you can listen a track from one album that has been released some years ago, that is for many years out of stock.